Conform California proposition 65. Nickel and Lead free. This jewelry is perfect for brides, bridesmaids, pageants or any special event. 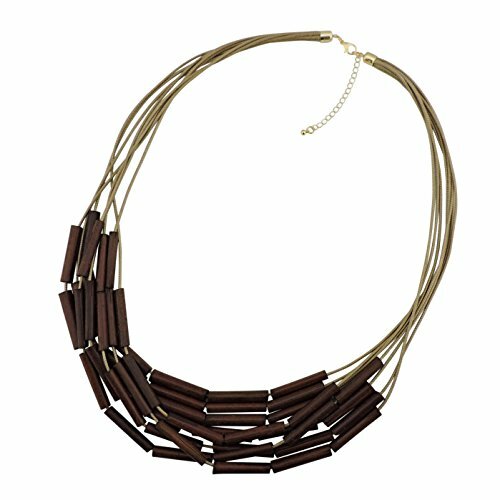 This necklace coordinates with any color or style wedding dress or formal ensemble. We always have an eye to good customer service as we receive orders, and continue to create new ideas. If you have any question about order and product,please send us message.We will reply your message within 24 HOURS. We are more than happy to help you and to introduce you to our fresh and beautiful jewelry. Search ''Bocar'' in Amazon , visit our store for more styles. Occasion: Casual, Party, Prom, Class, Wedding, Bridal, Office. If you have any questions about this product by Bocar, contact us by completing and submitting the form below. If you are looking for a specif part number, please include it with your message. BjB Endless Infinity Style 8MM Matte Finish Semi-precious Genuine Picture Jasper Beaded Necklace, 60" Long. 14k Yellow Gold Cubic Zirconia CZ Station Necklace, 16"
14K White Gold 8mm-9mm Black Freshwater Cultured AA Quality Pearl Strand Necklace, 18"